Thousands of jubilant Palestinians have greeted their leader Mahmoud Abbas, on his return from the UN session where he submitted a bid for independent Palestine. 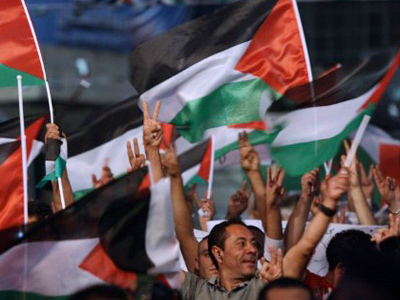 Despite the threat of a US veto, Abbas has called on his people to keep national pride. Addressing the crowds at his compound in the city of Ramallah on Sunday, Abbas, who is now witnessing a boost in his popularity, has called on his people to be proud Palestinians. "We are powerful and strong by your demands, so hold your heads high, you are Palestinians," Abbas added. The Palestinian leader reiterated that Israeli settlement activities on the West bank should be stopped. "There will be no negotiations without international legitimacy and a complete halt to settlements," he said. 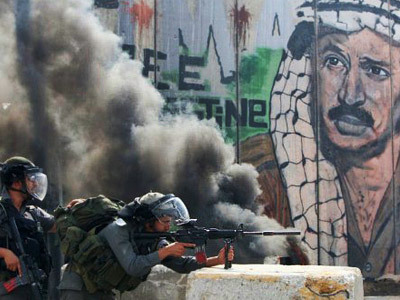 Mahmoud Abbas has also likened his campaign in the UN with the Arab Spring and proclaimed the “Palestinian Spring”. 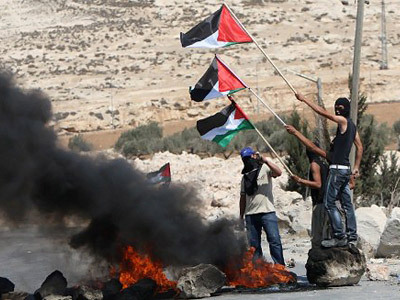 "We have told the world that there is the Arab Spring, but the Palestinian Spring is here," he said. "A popular spring, a populist spring, a spring of peaceful struggle that will reach its goal." The Palestinian leader is expected to meet with his top ministers later on Sunday to discuss the proposal for resumption of peace talks with Israel, put forward by the Middle East Quartet. A huge welcome party was planned in the presidential compound of the city on Sunday and a stage was set up next to the grave of the former Palestinian president Yasser Arafat. 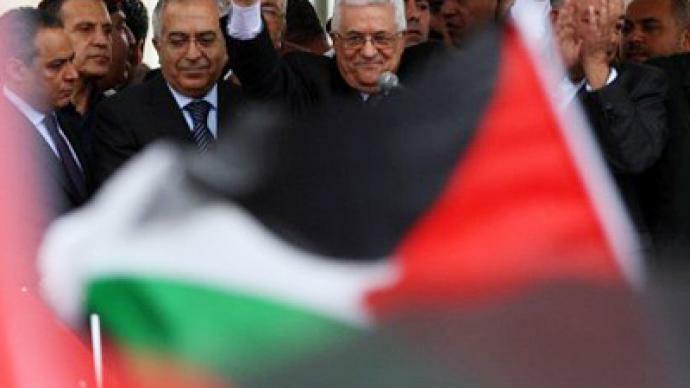 Prior to Mahmoud Abbas’s return, the Fatah party, as well as various Palestinian trade unions and state television, had called on Palestinians to come to Ramallah to welcome their leader home. 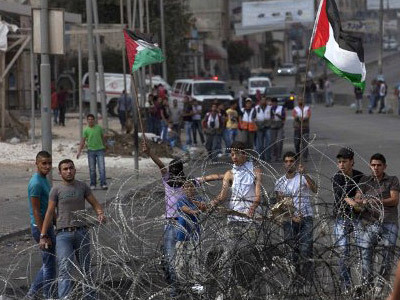 Buses had been organized to bring people from different parts of the West Bank to the city. On Sunday morning workers had decorated Ramallah streets with Abbas posters and Palestinian flags in anticipation for his return, AP reports. 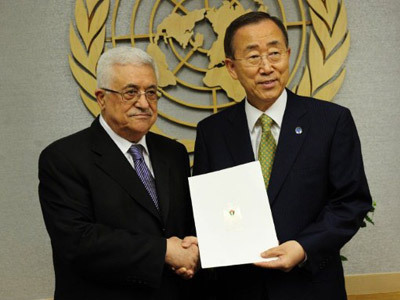 On Friday Mahmoud Abbas submitted a bid for full Palestinian membership of the United Nations. 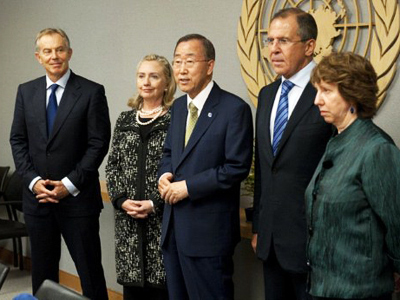 The bid is to be considered by the UN Security Council and is expected to be vetoed by the USA. According to Palestinian political activist Noor Odeh, despite the threat of the veto, Palestinians are now in a heightened mood due to the submission of the bid to the United Nations. Palestinians do not believe in the productivity of talks with the current Israeli government, social and political analyst Jamil Rabah told RT.